Get started on a lush, productive 4'x4' raised bed; that's 16 sq ft of vegetables, fruits and herbs, right in your own backyard. 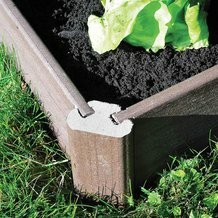 A smart choice for both beginners and gardeners who want to expand garden space quickly and easily. No tools or digging required. Note: Soil, plants and seeds not included. Note: Before assembling and planting, you will need to lay down weed block fabric or newspaper on the ground (not included) to help prevent weeds from growing into your bed. 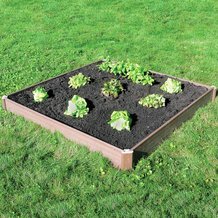 Raised Bed Gardening Set Get started on a lush, productive 4'x4' raised bed; that's 16 sq ft of vegetables, fruits and herbs, right in your own backyard. A smart choice for both beginners and gardeners who want to expand garden space quickly and easily. No tools or digging required. I purchased this product in the spring and it arrived well and was easy to put together. I followed the instructions and grew some lovely cucumbers over the summer. When I tried to take it apart this fall, the boards had warped and I could not get it apart to put it away on my own. After several attempts and being gentle, one of the boards snapped on both ends. I was very happy with the assembly and how the product worked, but I am very hesitant to purchase a replacement. I was going to build my inventory by purchasing one every spring but if they break after one use, it won't be worth it. Lehman's says: We're so sorry this happened. Please give us a call, so we can make it right: 1-800-438-5346.